If contact with nature is what you’re looking for, the Arenal Volcano area is ideal for you to visit and enjoy this four in one tour combo. 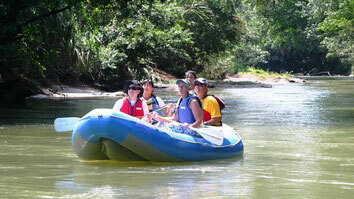 Around 7:00 am we’ll pick you up from your hotel and take you to where we’ll put in on the Peñas Blancas River in an inflatable raft. A naturalist guide will accompany you to point out the birds and identify the sounds of the animals and the plants in the natural environment that surrounds you. 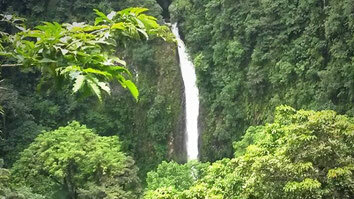 The second destination of the day is the La Fortuna Waterfall. A short, easy hike takes us to an overlook where you’ll enjoy a panoramic view of the waterfall and its surroundings; this is a perfect photo opportunity. 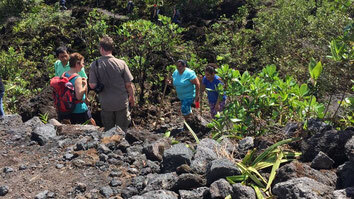 Afterwards we descend the trail to the river where you can swim at the base of the waterfall. Lunch at a restaurant in La Fortuna is included. Hike the trails that take us to the closest spot you can safely get to Arenal Volcano from where on clear days you’ll have a spectacular view of the colossal volcano, the sunset, and Lake Arenal. This short hike on easy trails lasts approximately two hours, and as always you will be accompanied by a guide providing you with relevant information. 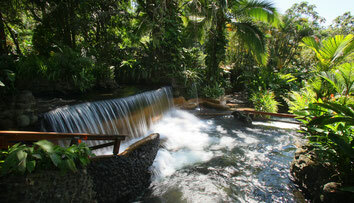 After visiting these sights we allow you to choose which spot you want to go to enjoy one of the main attractions in the area—the Hot Springs that emanate directly from Arenal Volcano. Choose your preference and end the day relaxing and wanting to see even more the following day. 7:00 am (exact time depending on the proximity of the Hotel where you are staying).